Jillian Simpson, Maclean Vu, Harrison Rich, and Isabel Galvan. Special thanks to Lee Stetson for providing our audio narrations of John Muir. 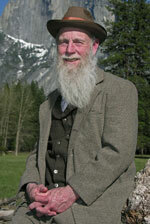 Lee Stetson portrays John Muir in a theatrical performance in Yosemite Valley. Special thanks to Margo Praus and Richard Abood, members of the Stockton Delta-Sierra Club, as well as the other members of the club for participating in an interview with us.